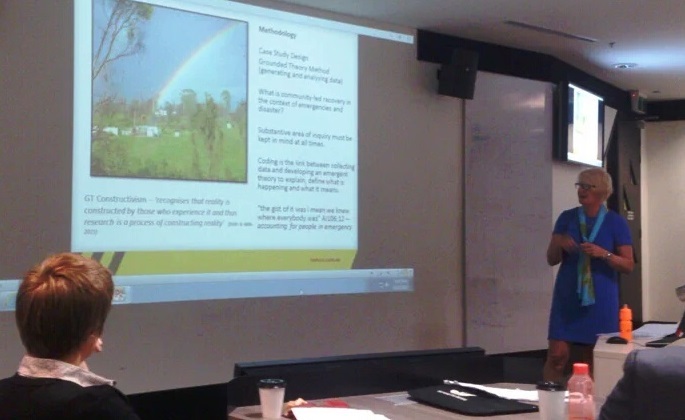 Below is a recording of a 20 minute presentation I recently gave on my PhD research as part of the Thinking Space seminar series in the School of Geosciences at the University of Sydney. Each project gave a number of presentations which were then discussed. End users offered their thoughts, particularly in breakout sessions centred on improving research utilisation, and a guest presenter, Professor Mary Comerio from the University of California, Berkeley, gave a keynote presentation on resilience, recovery and community renewal. I was able to present my PhD work to a varied and diverse audience of both people with research backgrounds and those in industry and professional roles (the StoryMap I used for my presentation is here: http://tinyurl.com/nzxrju4). 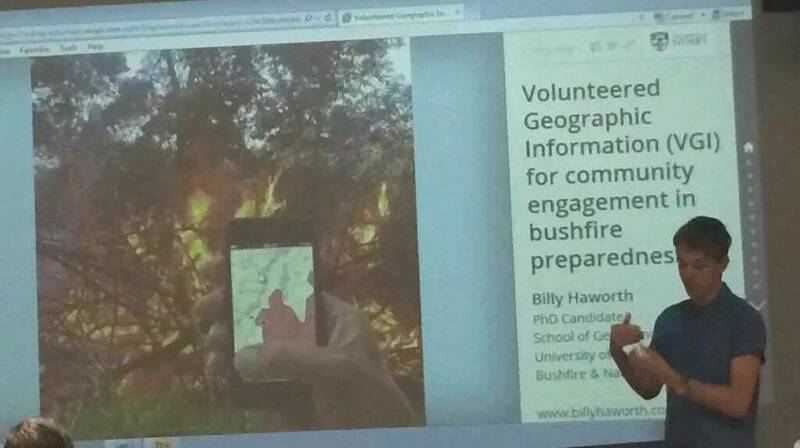 My research investigates the social practice of citizens creating and sharing geographic information in disaster management and the potential use of enabling technologies, such as crowdsourced mapping, social media and smartphones, for increasing community engagement in bushfire preparation. These practices are quite dramatically impacting professional systems and traditional authoritative emergency management. So, to have that breadth of expertise in the field listening to and commenting on my findings was a unique and valuable experience. Being located in different cities, it was an excellent opportunity to catch up on how the broader research my own work is connected to is progressing. I was able to foster existing connections with other researchers in my project (Out of uniform) and its end users, engage with complementary research, and also make new ties important for my current research and my future career. I gained useful insight into the collaborative research process between academia and industry. I gained insight into the challenges of research communication and utilisation, particularly in attempting to align research goals and outcomes with agency needs whilst navigating often-rigid organisation structures and processes. The sometimes-competing nature of these two different systems and ways of operating with different needs and different values at times felt a little akin to my own research, which considers how to align mostly-unstructured citizen information-sharing practices with highly structured formal systems of information control and dissemination in authoritative emergency management. In both cases I think balance is important to gain the most beneficial and optimised outcomes for all parties. A balance of needs and methods to meet those needs, but also a balance of expectations. One minor concern I had during the workshop was that perhaps some other people important in the research needed to be there for these discussions. While it was fantastic to have the interaction of researchers and agencies, I thought, who was missing? Given the out of uniform project in particular is centered on people volunteering and participating in disaster management outside of formal or traditional settings (e.g. emergent community groups, spontaneous volunteers, online activities), I felt more people from community engagement organisations and roles, as well as representatives of these non-traditional volunteering groups would have been extremely valuable contributors in the workshop. PhD student at RMIT Fiona Jennings’ research, for example, is exploring community-led bushfire recovery with really valuable insights even in its early stages. While Fiona’s research clearly has important lessons for emergency agencies, I felt like the real ‘end users’ of her research might in fact be community organisations and community members undertaking disaster recovery. Yet, representatives of those groups unfortunately weren’t as present at the event and hence not included in the discussions. Overall I thought it was a really useful event and I’m grateful for the opportunity to be involved. My impression is it is quite rare in academic research to have such a close relationship with industry like the BNHCRC provides. While the end users may benefit from the researcher’s findings, we also benefit enormously from having their input throughout the research journey. I’m unlikely the first person to say it, but perhaps ‘end user’ is the wrong term. This workshop alone highlights the important role the agency representatives play in contributing to the research development, progression and utilisation as partners, not simply end users of the outputs, and I hope they remain active and excited about their involvement in the research. I look forward to the next opportunity for us to share more ideas in the future. Earlier this month I was fortunate to attend the annual Australasian Fire and Emergency Service Authorities Council/Bushfire & Natural Hazards Cooperative Research Centre (AFAC/BNHCRC) conference in Adelaide, South Australia. I was invited to give a Three Minute Thesis presentation, which I did. 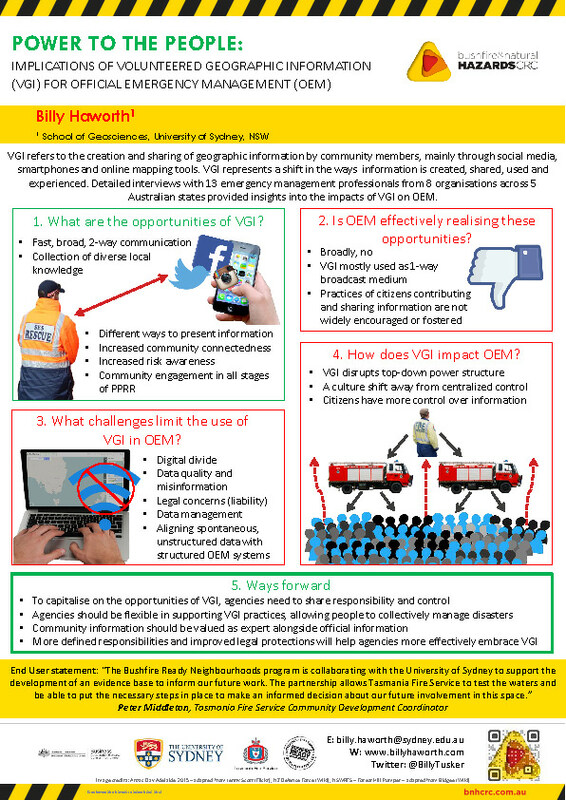 I also presented a poster on the implications of VGI on traditional emergency management from some of my PhD research, and here it is for you to look at for free and keep forever!